Gives you a smooth, comfortable shave. A highly effective daily use shaving cream formula that eases the shaving process; smoothing and hydrating the surface of the skin and beard to ensure the closest and cleanest shave. Moisturising and cleansing extracts work during the shave to re-hydrate, soothe and condition the beard area, helping to prevent razor burn and blocked pores. How to use: Dampen skin with hot water and scoop cream onto hands. Work into the beard area and shave in the direction of the hair growth. How it works: Shaving doesn‘t have to be a drag! 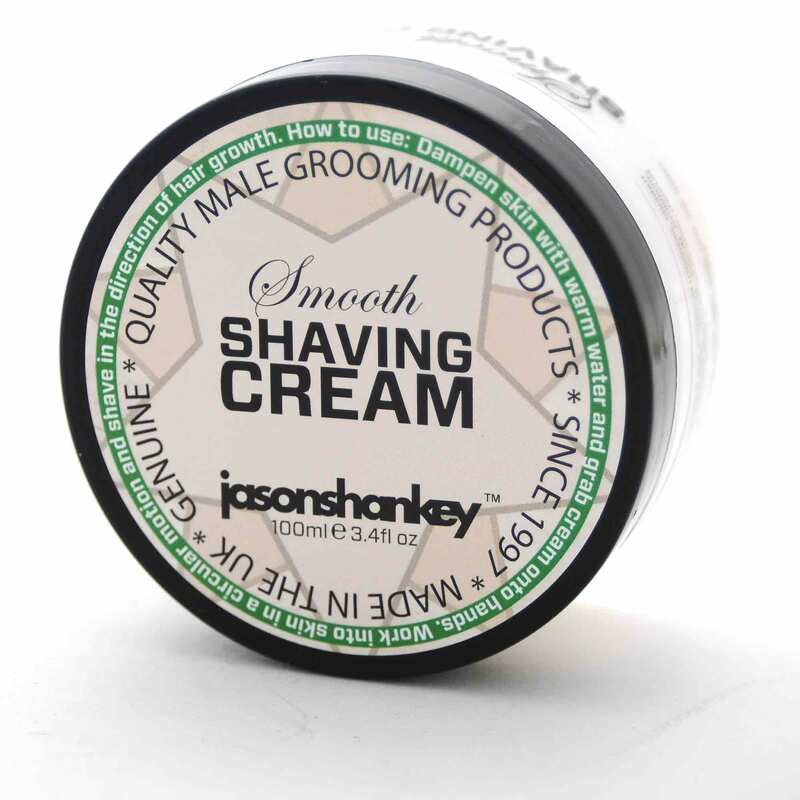 Jason Shankey Smooth Shaving Cream solves men‘s most common shaving problems by using a unique and innovative approach – Education combined with our ultimate moisturising and lubricating formula. For the best results, we recommend using our shave cream in conjunction with our Post-Shave Moisture Balm. Top tips: For the best possible shave with the least skin irritation, dampen your skin with warm water. Shaving in or just after a shower is perfect! Rub the shave cream into your face in a circular motion to ensure good skin coverage. Then, with a sharp razor, shave in the direction* of your hair growth applying medium pressure to the razor. Once you‘ve finished the shave, splash your face with cold water to close the pores. Pat dry and apply Jason Shankey Post-Shave Moisture Balm to condition your skin and protect it from the environment. * Men‘s hair generally grows in different directions in different areas of the face, and shaving against the direction of the hair growth can result in ingrown hairs, razor bumps and a shaving rash. You can easily find the best direction in which to shave by rubbing your beard growth with your hand in different directions. When it feels smoother in one direction, that‘s the direction in which you should shave.